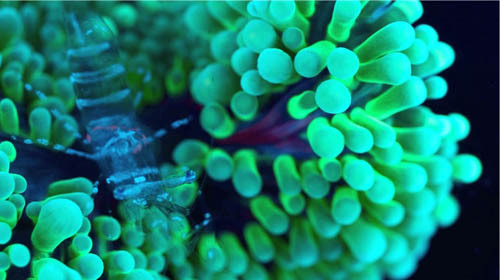 Featured in the the video is a unidentified shrimp that lives commensally on Ricordea sp. corallimorph polyps. Unlike the other commensal anemone/corallimorph shrimp (Periclimenes pedersoni, P. yucatanicus) that are active fish cleaners, this shrimp moves considerably less. In fact it is nearly invisible. The transparency of this shrimp is such that if you look carefully in the middle of its abdomen, you’ll notice its beating heart. Even the fluorescent pink ring around the edge of the unidentified ricordea polyp’s mouth is visible through the shrimp’s tail.